Funny, that's what often happens when I try to pull a rabbit out of my hat. Since the other page does up my work stuff, I thought you might want to see that I'm not a totally boring putz. Have fun looking around, but please turn out the lights and close the door behind you when you leave. Last updated on December 12, 2016. First, you might like to know that this page has been rated among the bottom 95% of all web sites by those fine, fine, folks at Pointless Communications, back when they maintained the site for this reward. I lament the passing of the award for the rest of us. Second, you should know that, unlike my main page, this page has not been reviewed by, nor is its content necessarily endorsed by, The University of Dayton, The School of Business Administration, The Department of Management Information Systems, Operations Management & Decision Sciences, The Easter Bunny, Bugs Bunny, or any other entities, persons, or fictional characters that might be concerned about things I might say. I don't speak for any of these and they don't speak for me. Actually, my main page hasn't been reviewed by any of the above, either, but there isn't anything all that interesting there anyway, so I don't think they'll mind (come to think of it, I don't say much interesting here, either). I didn't say they'd be of me, did I? The one above (no, I didn't take it) reflects my state of mind, generally at the end of the semester, or when I'm trying to get a paper out. The ones below are of a different nature. This shot is at the USS Arizona Memorial in Pearl Harbor. It was taken with a simple "point and shoot" camera at about 8 in the morning. 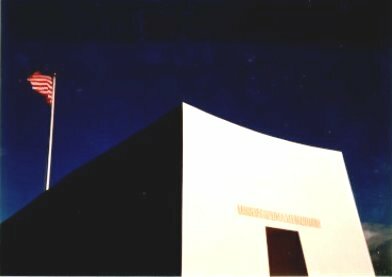 I was especially taken with how the bright sun washed out the eastern face of the monument, to the extent that it created a really sharp contrast with the side of the monument. 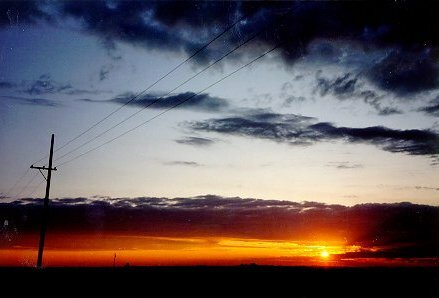 This shot was taken at about 6 AM just north of Lethbridge, Alberta, again with my trusty point and shoot. I lived in western Canada for four years, and never ceased to be amazed by the tremendous natural beauty of the place (this photo is just a sample). An ad for Tourism Canada states that "America borders on the magnificent". As it pertains to Alberta, they got that right. Next, one of li'l' old me. 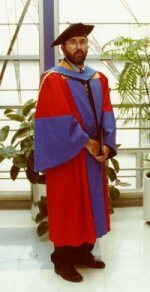 This was taken at my convocation, where I received my Doctorate in Management Information Systems from the University of Calgary. Actually, I like the regalia so much, I bought it. Hope Mum likes the picture. Finally, (since I haven't added much to this page in a while) one of my dog Louie (in front), and the neighbor's dog Biscuit. Louie is a pound rescue dog, adopted from the good folks at the Rutherford County (TN) Humane Alliance. Louie's a Lemon Basset (apparently being a Lemon's a big deal to Basset owners; Louie seems rather unaffected by the distinction). He sleeps around the house, eats, forces me out on walks, gnaws on his rawhide bones (but not anything else except pencils), plays with his squeaky toy, jumps on the couch when I'm not looking (hence I purchased leather furniture - it's a LOT of grief to get his hair out of the couch) and generally makes the house a little nicer place to live (he's also housebroken, which is probably more than I can say for myself). If you are looking for a good pet you might want to consider adoption as well. 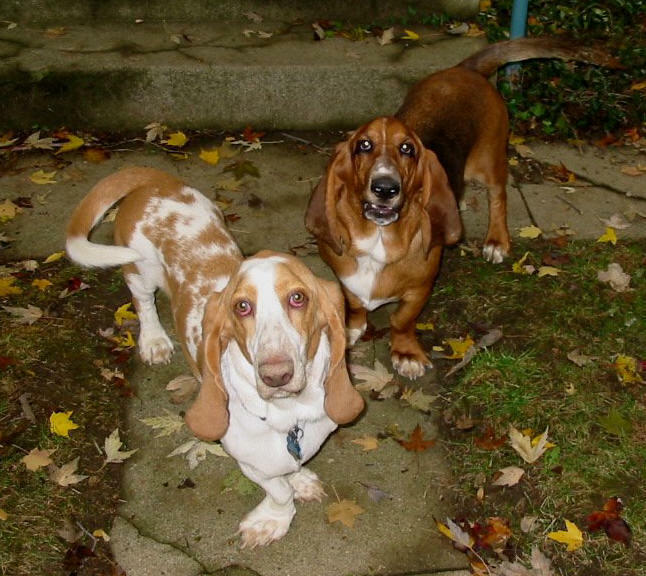 Bassethoundrescue.com is one site that specializes in Basset rescues. Finally, I would be most remiss if I didn't mention the lovely young lady who has had pity on me and consented to marry me in June of 2004. 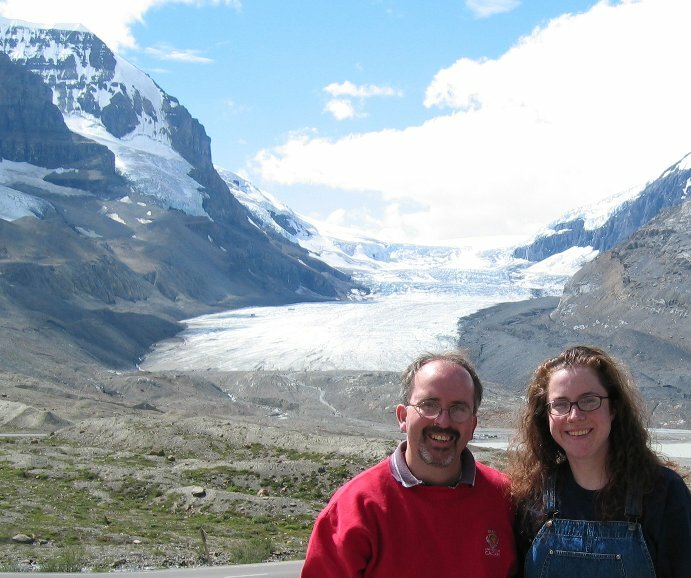 Here's a picture of us taken at Columbia Ice Fields. Aren't I lucky? (I'll put what I really think here later when she's not standing behind me with a large club) :-). Down Under (Bryson) - sold in the U.S. as "In a Sunburned Country"
Music is something that helps me escape from the hustle of work. My range of favorites is a bit wide, so it's likely that you'll find something to which you can relate. The following is but a sampling of the range. Everybody's got to have some of these. I'll be adding more as I browse around, or as my students enlighten me. Some of these make literally no sense save that they just appeal for one reason or another. Since this is the bottom of the page, I thought I should leave you with some wit and wisdom. In particular, I rather like this one--in fact, it graces my dissertation (as the frontispiece).